Art is an expression of creativity, a conveyance of beauty, and for naturalists, it is a way to process, remember and interpret nature. Many branches of nature art are popular, such as photography, painting and sketching. 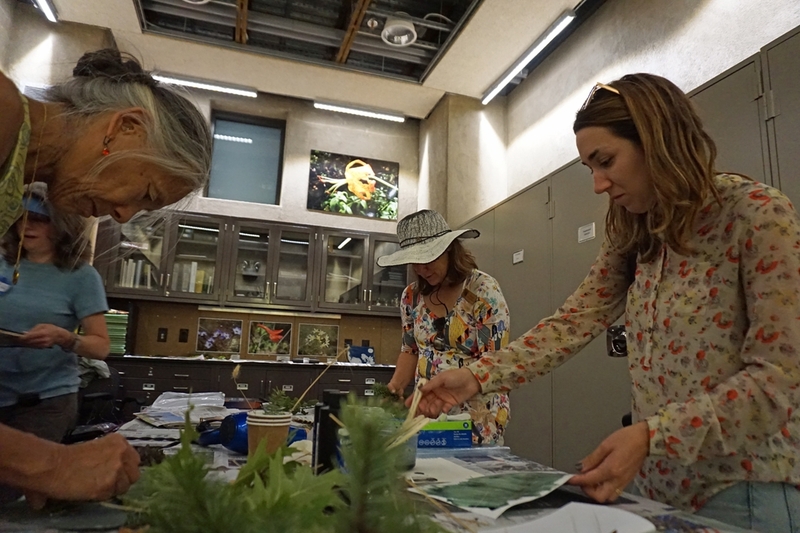 The UC California Naturalist Regional Rendezvous in October introduced an old but uncommon method for documenting natural objects – cyanotype. Cyanotype is a photographic printing process invented in the mid-1800s. It is best known as the long-time technique for duplicating building designs and the reason they are still called “blue prints.” Now the deep cyan blue can be an artistic backdrop to the interesting shapes and forms of natural treasures. At the CalNat Rendezvous at the Pepperwood Preserve, Santa Rosa artist Jessica Layton taught the cyanotype process to volunteers certified by the UC California Naturalist program, giving them a new tool to use in educating and engaging children and adults in conservation organizations they work with around the state. The cyanotype process begins by mixing two chemicals - ferric ammonium citrate and potassium ferricyanide – to create the blue photo reactive solution. The chemicals may be purchased at art stores and online by searching for cyanotype solutions. California Naturalists paint on the cyanotype solution in a darkened room. Once blended, the chemicals are painted on paper or cotton cloth and allowed to dry. Leaves, grasses, seeds, pine cones, flowers, stones – any number of natural objects collected outside may be artfully arranged on the blue background and, if needed, held in place with a pane of glass. The project is then set out in bright sunlight for 5 to 7 minutes, brought back inside to be washed in clean water and allowed to dry. The areas of the paper or cloth exposed to the sun are a radiant lapis blue; the areas that were shaded by the natural objects appear in silhouette. 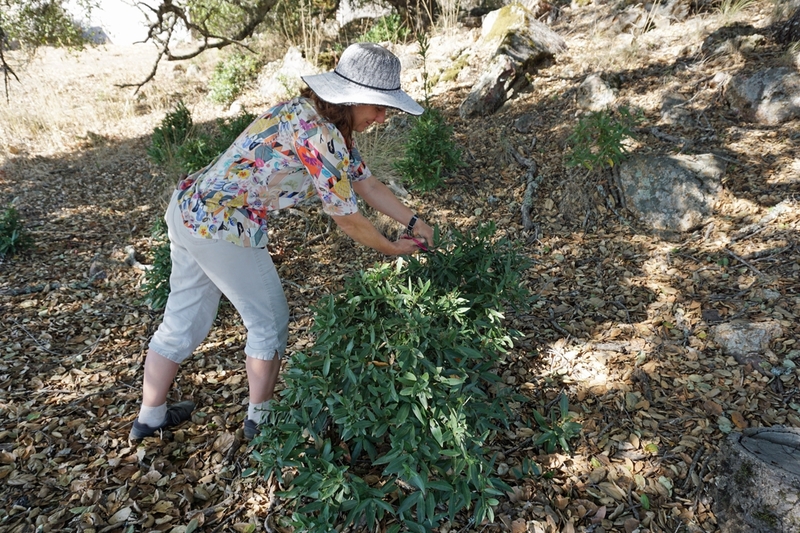 Director of the UC California Naturalist program, Adina Merenlender, collects natural objects at Pepperwood Preserve for making cyanotype art. The director of the UC California Naturalist Program, Adina Merenlender, participated in the cyanotype training. 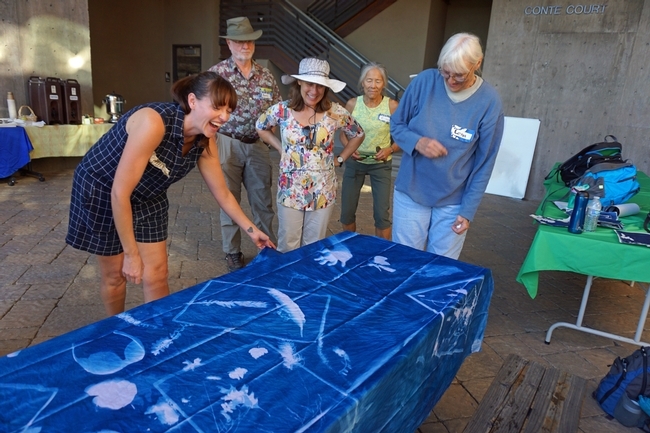 Artist Jessica Layton, left, shows a cyanotype mural project made by the group. The fabric was commercially treated with the cyanotype solutions and captured the silhouettes of a wide variety of objects, including feathers, hands, sunglasses and a water bottle. 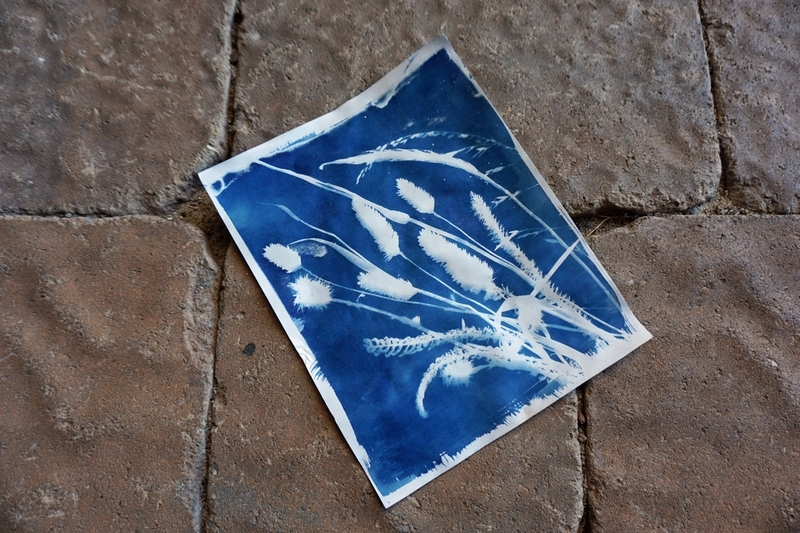 California Naturalist Kat Green said she's seen cyanotype before and always wanted to try it, so jumped at the chance to practice the project at the CalNat Regional Rendezvous. "Different people connect with nature in different ways," Greene said. "I don't have an artistic knack, so being able to share this experience with people allows me to connect with them in a way I couldn't connect otherwise."